Malone was born in Monroe County, Alabama in 1942, the fourth of eight children. Her parents both worked at Brookley Air Force Base; her father served in maintenance and her mother worked as a domestic servant. Her parents emphasized the importance of receiving an education and made sure that their children attended college. Each of Malone's older brothers attended Tuskegee University. Her parents were also active in civil rights and often participated in local meetings, donations, and activities in the community that promoted equality and desegregation. As a teenager, Vivian was often involved in community organizations to end racial discrimination and worked closely with local leaders of the movements to work for desegregation in schools. Malone attended Central High School, where she was a member of the National Honor Society. In February 1961, she enrolled in Alabama Agricultural and Mechanical University, one of the few colleges for black students in the state. She attended Alabama A&M for two years and received a Bachelor's degree in Business Education. Malone had wanted to pursue a degree in accounting, a field of study not offered by Alabama A&M at the time. Moreover, the bachelor's degree Malone received was issued to her before the University had been fully accredited by the Southern Association of Colleges and Schools. To earn an accredited degree in accounting, Malone would have to transfer to another university. In 1961, Malone had received word from a family friend that the local Non-Partisan Voter League had organized a plan to desegregate the University of Alabama's branch school in Mobile. Due to her exceptional performance in high school, Malone was one out of a number of local black students the organization suggested apply to the Mobile campus. At least 200 black students had applied to the university only to have their applications rejected by admissions. The university denied admission to the applicants on the grounds of over enrollment and closed enrollment, the quotas already being filled or the academic performance of the students not meeting required standards; however it had become fairly understood by the community that the university would not admit the black students because of resistance to school desegregation. Black students who had applied to the university's branch campus in Mobile were investigated by the university's department of Public Safety, including Malone. After applying to the Mobile branch of the University of Alabama, Malone and her family had been visited by two white men who had claimed that they were representatives of the state. They disclosed that her attempts to apply to the Mobile campus and integrate with the school had instigated violent retaliation from the local white community from which the family would not receive much protection. The threat to her safety did not deter Malone from continuing to support integration in the university and she persisted in applying to the University of Alabama to earn a degree in accounting. The NAACP Legal Defense and Educational Fund of Alabama organized an opportunity with Malone to enroll her in the University of Alabama's School of Commerce and Business Administration to earn her accounting degree. The Legal Defense Fund had been working closely with a student, James Hood, to desegregate the University of Alabama. After two years of deliberation and court proceedings, she and James Hood were granted permission to enroll in the university by order of District Court Judge Harlan Grooms in 1963. The district court had ruled that the University of Alabama's practice of denying black students admission into their university was a violation of the U.S. Supreme Court's ruling in the Brown v. Board of Education case in which the act of educating black children in schools intentionally separated from white students was charged as unconstitutional. Judge Grooms had also forbidden Governor Wallace from interfering with the students' registration. After seeing that Wallace would not step aside, Katzenbach called upon the assistance of President John F. Kennedy to force Wallace to permit the black students' entry into the university. Katzenbach took Malone up to her dormitory and told her to see her room and eat lunch alone in the dining room if she became hungry. Malone went downstairs into the dining room, and was surprised to be joined by several white students, who ate lunch with her. She remained in the dormitory until the situation was determined to have calmed down. President John F. Kennedy federalized the Alabama National Guard later the same day, which put them under the command of the President, rather than the Governor of Alabama. One hundred guardsmen escorted Malone and Hood from their dorms back to the auditorium, where Wallace moved aside at the request of General Henry V. Graham. Malone and Hood then entered the building, albeit through another door. As she and Hood entered the building, they were met with surprising applause from white supporters of integration. They then entered the gym and registered as students of the university, with Malone being accepted into the University as a Junior. 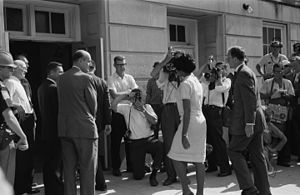 Malone's time spent at the University of Alabama was relatively free of conflict and threats to her safety, with the exception of a spree of bombings that occurred in November 1963 by rioting whites possibly angry with the integration policy. After much deliberation between the U.S. Marshal and Katzenbach, it was decided that Malone would not be taken out of school or unenrolled because of the bombings. Two years later, in 1965, she received a Bachelor of Arts in business management and became the first black to graduate from the University of Alabama. She graduated with a B-plus average. She was appointed to a position as the Executive Director of the Voter Education Project and worked towards voter equality for minorities, thus assisting millions of blacks to register to vote. She later became the Director of Civil Rights and Urban Affairs and Director of Environmental Justice for the U.S. Environmental Protection Agency, a position she held until her retirement in 1996. In October 1996, Jones was chosen by the George Wallace Family Foundation to be the first recipient of its Lurleen B. Wallace Award of Courage. At the ceremony, Wallace said, "Vivian Malone Jones was at the center of the fight over states' rights and conducted herself with grace, strength and, above all, courage." In 2000, the University of Alabama bestowed on her a doctorate of humane letters. Jones died following a stroke at age 63 on October 13, 2005 in an Atlanta hospital. Her funeral services were held at the Martin Luther King Jr. International Chapel at Morehouse College. Jones was married to Dr. Mack Arthur Jones, a physician, who predeceased her in 2004. She was survived by a son, a daughter, three grandchildren, four sisters and three brothers. She was a faithful member of From the Heart Christian Ministries of Atlanta where she served as an usher. Her brother-in-law Eric Holder served as U.S. Attorney General. Her nephew Jeff Malone was an All-America basketball student-athlete at Mississippi State University and NBA standout. ^ a b c d e f g h i j k l m Clark, E. Culpepper. "The Schoolhouse Door". Oxford University Press, 1993, pp. 175-176, 225-228. ^ a b c d e f Martin, Douglas (October 14, 1995). "Vivian Malone Jones, 63, Dies; First Black Graduate of University of Alabama". New York Times. Retrieved March 8, 2013. ^ "400 Years of the African American Civil Rights Experience". docslide.net. Retrieved August 7, 2017.